When looking for adjectives to describe Coheed and Cambria and their latest effort, The Unheavenly Creatures, I kept going back to the same word: epic. Coheed have never been strangers to expanding their repertoire of complex space odysseys and intermingled stories of fictional characters, but on this LP they have genuinely created something quite remarkable. This album grabs your interest directly from the first notes of “Prologue” that sets that stage for all that will come next in this saga. From the shiny and brilliant packaging of the entire album and its artwork, it’s hard not to get directly sucked into the vortex of Coheed’s world on this fantastic record. Coheed and Cambria will release their new album, The Unheavenly Creatures, on October 5th. The album is over 75 minutes long and was self-produced. Pre-orders for the boxset are now available. Coheed and Cambria have returned with the expansive, space epic-inspired song “The Dark Sentencer.” The track itself has been broken into two unique parts: a short prologue and the aforementioned track itself. The prologue sets the stage for where this story takes place in the universe that Coheed has created through a multiple album series. Know now there is no time, space between the Well & Unknowing. Our story starts there. Well into our future, yet far beyond our past. In a romance between a pair of Unheavenly Creatures. The Five Houses of the Star Supremacy have privatized the detention zones of the galaxy. These planetary prison pits reassembled from the cracked worlds of the Great Crash. Which brings us to our stage. Where the light must learn to love the black. The Dark Sentencer. It begins with them, but ends with me. Their son, Vaxus. Still with Coheed on this one? Coheed and Cambria have released their new song “The Dark Sentencer.” You can read the full press release below. Coheed and Cambria have signed with Roadrunner Records. They’ve shared the news in a new announcement video. Coheed and Cambria and Taking Back Sunday have announced a tour together. We had been sitting on these songs and dabbling with a few more that we’ve been working on and we asked ourselves, “What do we do with these? What is the project? Is it a full-length album, an EP?” And then this event happened on the end of all of these horrible events. We had the earthquake in Mexico, the impending storms in Houston and Florida, all of these things. It just felt like people had been financially tapped out from trying to help these disasters because there were so many. These things happened at a time when Puerto Rico needed as much relief as they could possibly get. For us, there’s a heritage piece — Claudio’s father is from Bayamón and has family down there. Bigger than that, we wanted to figure out how to help a cause that desperately needs help. The EP can be purchased on Bandcamp and proceeds will go to hurricane relief efforts in Puerto Rico. Coheed and Cambria have posted up a video of Claudio talking about the reissue of Good Apollo, I’m Burning Star IV for Record Store Day. Owel have covered “The Light & The Glass” by Coheed and Cambria. Coheed and Cambria has announced a new tour where they’ll be playing Good Apollo, I’m Burning Star IV: From Fear Through The Eyes of Madness in full at each date. You can find the dates below. 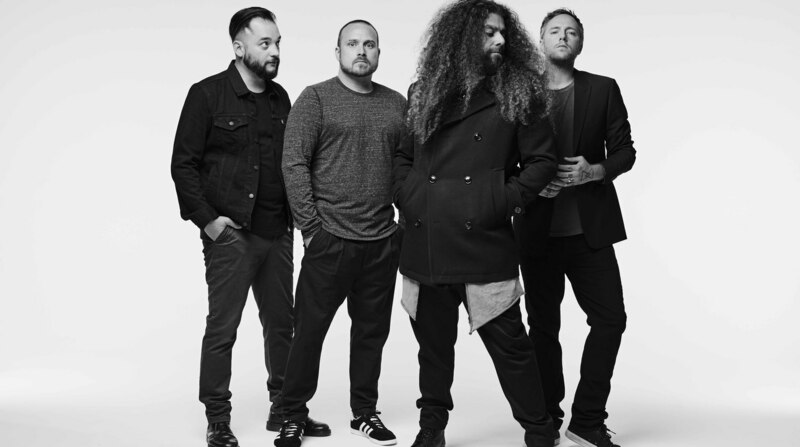 Coheed and Cambria have released a new video for “Bridge and Tunnel.” They’ve also released a deluxe edition of their latest album on iTunes and Spotify. The full press release can be found below. Orange County’s all-ages venue, Chain Reaction, has announced Chain Fest. The festival will take place on Saturday, September 17th at the Observatory Grounds in Santa Ana, California. Coheed and Cambria, Underoath, and Circa Survive will be headlining along with Portugal. The Man, MXPX, Title Fight, Anthony Green, Basement, Citizen, Dance Gavin Dance, Elder Brother, Hail The Sun, Mat Kerekes, Movements, Nomads, Onelinedrawing, Secret Space, Tigers Jaw, Turnover, Up Syndrome, and Zao. VIP tickets are on sale now. General admission goes on sale on Friday. Adam Grundy reviews the new album from Coheed and Cambria. Adam Grundy reviews the latest single from Coheed and Cambria.